Back cover blurb: Paige Dawson: the mother of a murdered child and wife to a dead man. She has nothing left to live for… until she finds her husband’s handgun hidden in their house. Why did Ryan need a gun? What did he know about their daughter’s death? Desperate for the truth, Paige begins to unearth her husband’s secrets. But she has no idea who she is up against, or that her life isn’t hers to gamble – she belongs to me. 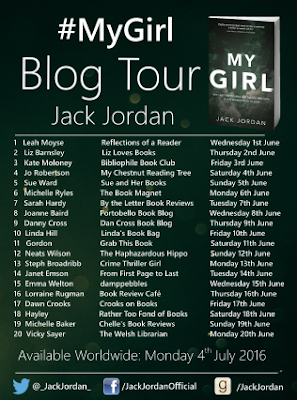 From the bestselling author of Anything for Her, Jack Jordan's My Girl is the new chilling thriller that you won't want to miss. 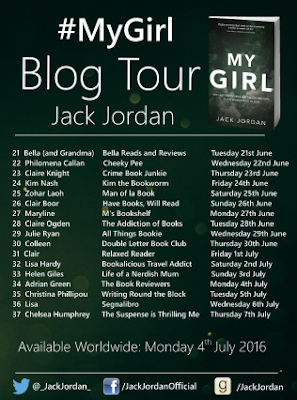 When I read Jack Jordan's debut novel, Anything For Her I realised that he was an author to watch. 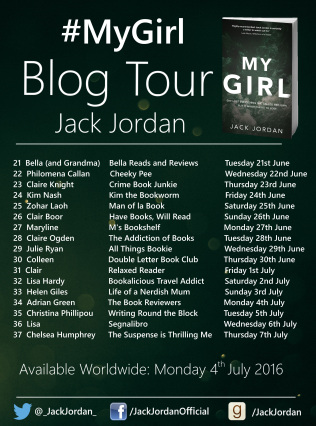 My Girl has now made Jack one of my go-to thriller authors, and I can't wait to see what he has up his sleeve for his next novel. Paige Dawson is a broken woman, A grieving widow; her husband has committed suicide and a childless mother; her daughter was brutally murdered ten years ago and her killer never found. Her life has been shattered in the worst imaginable way. Perhaps understandably Paige drinks a lot. Her friends and family are worried about her, particularly as her behaviour becomes more and more erratic. But what does she have to live for? Paige's Father, is desperate to help her, and as he helps her clear out her husbands things, in the hope she might begin to move on, Paige finds a gun in the hidden compartment of a filing cabinet. Why on earth did her husband have a gun? Did he have a double life she knew nothing about? Or was he just trying to protect them both after the death of their daughter? Paige knows that if she decides to delve into the reasons behind her husbands secret then she may find something more than she bargained for but nothing could prepare her for what she is about to uncover. 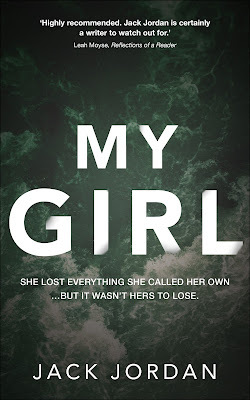 I can't say much more without starting to give away some of the plot, but know this; My Girl is a dark, disturbing novel that grips you from its first page and doesn't let you go until its final sentence.